Covers how to configure the framework, define your domain model, create standard Wicket components and add internationalization options. Apache Wicket is a Java-based web application framework that has rapidly grown to be a favorite among many developers. It features a POJO data model, no XML, and a proper mark-up / logic separation not seen in most frameworks. Apache Wicket gives you a simple framework for creating powerful, reusable components and offers an object oriented methodology to web development while requiring only Java and HTML. 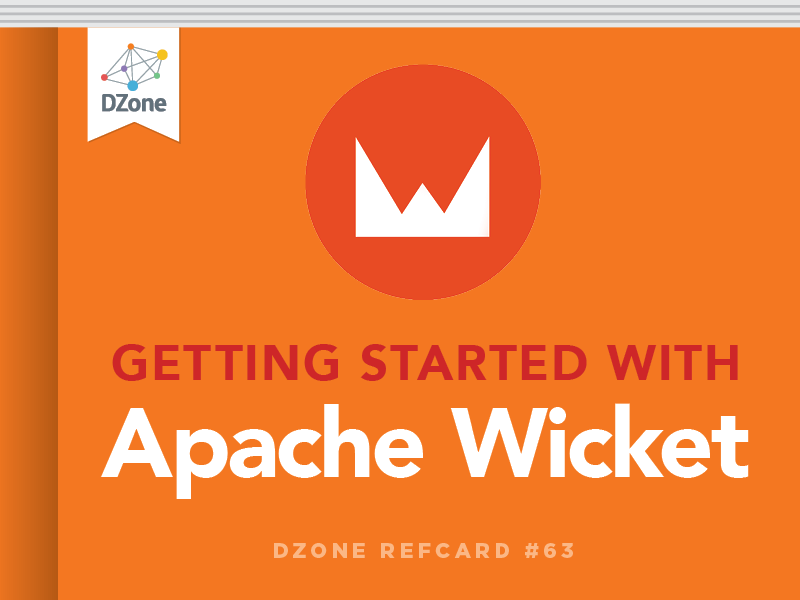 This Refcard covers Apache Wicket 1.3 and describes common configuration, models, the standard components, implementation of a form, the markup and internationalization options available. Either way, if using Maven, you’ll need the wicket jar, and the latest slf4j jar. I mentioned that Wicket has no XML, and that’s mostly true, but J2EE requires a web.xml file to do anything. We set up the WicketFilter and point it to our implementation of WebApplication along with the URL mapping. Apache Wicket uses models to separate the domain layer from the view layer in your application and to bind them together. Components can retrieve data from their model, and convert and store data in the model upon receiving an event. There are a variety of implementations of Model, and they all extend from the interface IModel. There are only two methods that a class would have to implement to be a Model, and that is getObject and setObject. getObject returns the value from the model, and setObject sets the value of the model. Your particular implementation of IModel can get data from wherever you’d like; the Component in the end only requires the ability to get and set the value. Every component in Wicket has a Model: some use it, some don’t, but it’s always there. A model contains a domain object, and it’s common practice to follow JavaBean conventions. The PropertyModel allows you to use a property expression to access a property in your domain object. For instance if you had a model containing Person and it had a getter/setter for firstName to access this property, you would pass the String “firstName” to that Model. An even fancier way of using models is the CompoundPropertyModel. Since most of the time, the property identifier you would give Wicket mimics that of the JavaBean property, this Model takes that implied association and makes it work for you. We can see from the example above, that if we set the model with the person object using a CompoundPropertyModel, the corresponding components added to this parent Component will use the component identifiers as the property expression. In order to keep domain objects around, you’re either going to need a lot of memory / disk space, or devise a method to minimize what gets serialized in session. The detachable design helps you do this with minimal effort. Simply store as little as needed to reconstruct the domain object, and within the detach method that your Model overrides, null out the rest. Here we have two constructors, each grabbing the identifier and storing it with the Model. We also override the load method so that we can either return a newly created Object, or use an access object to return the Object associated with the Model’s stored identifier. LoadableDetachableModel handles the process of attaching and detaching the Object properly giving us as little overhead as possible. Now that we have an idea about what makes up a Component, let’s look at a few of the building blocks that make up the majority of our Pages. Forms and their Components are so important they have their own section. When developing your application, if you’d like to show text on the frontend chances are pretty good that you’ll be using the Label Component. A Label contains a Model object which it will convert to a String for display on the frontend. The first portion is an HTML template, which gives a component identifier of “message” which must be matched in the Java code. The Java code passes the component identifier as the first parameter. Below is a list of the different types of links, bookmarkable and non-bookmarkable, and how they are used to navigate from page-to-page. This method, while it looks more complex, allows us a lot more flexibility in building our lists to show to the user. The two list approaches described above each suffer from some drawbacks, one of which is that the entirety of the list must be held in memory. This doesn’t work well for large data sets, so if you need finer grain control on how much data is kept in memory, paging, etc., DataTable or DataView is something to look into. The beauty of Wicket is that reuse is as simple as putting together a Panel of Components and adding it to any number of pages – this could be a login module, a cart, or whatever you think needs to be reused. For more great examples of reusable components check out the wicket-extensions (http://cwiki.apache.org/Wicket/wicket-extensions.html) and wicket-stuff (http:..wicketstuff.org/projects). Since Wicket always needs a tag to bind to, even for a label, a <span> tag is sometimes easier to place into your markup; however, this can throw your CSS design off. .setRenderBodyOnly(true) can be used so the span never shows on the frontend but be careful using this with any AJAX enabled components, since it requires the tag to stick around. A Wicket Page is a component that allows you to group components together that make up your view. All Components will be related in a tree hierarchy to your page, and if the page is bookmarkable you can navigate directly to it. Tocreate a new page, simply extend WebPage and start adding components. Apache Wicket does require adding some attributes and tags to otherwise pristine X/HTML pages to achieve binding with Component code. The following table illustrates the attributes available to use in your X/HTML templates, the most important and often used being wicket:id. The following table lists out all of the most commonly used tags in X/HTML templates with Wicket. won’t affect the resulting HTML. wicket:head Adding this to the root-level hierarchy of the template will give you access to inject code into the X/HTML <head></head> section. wicket:remove The entire contents of this tag will be removed upon running this code in the container. Its use is to ensure that the template can show design intentions such as repeated content without interfering with the resulting markup. wicket:fragment A fragment is an inline Panel. Using a Panel requires a separate markup file, and with a fragment this block can be contained within the parent component. A Form in Wicket is a component that takes user input and processes it upon submission. This component is a logical holder of one or more input fields that get processed together. The Form component, like all others, must be bound to an HTML equivalent, in this case the <form> tag. Form input controls can each have their own Models attached to them, or can inherit from their parent, the Form. This is usually a good place to use CompoundPropertyModel as it gets rid of a lot of duplicate code. As you can see, each input component should be added to the Form element. The following table lists all the different form components available, and how to use them with Models. More than one validator can be added to a component if needed. For instance, if you have a password that needs to be within the range of 6 – 20 characters, must be alphanumeric and is required, simply chain the needed validators above to your component. If the validators listed above don’t fit your needs, Wicket lets you create your own and apply them to your components. When Wicket has completed processing all input it will either pass control to the Form’s onSubmit, or the Form’s onError..If you don’t choose to override onError, you’ll need a way to customize the error messages that show up. Earlier sections touched on the order of resource bundles importance from the Page down to Wicket’s default application. Apache Wicket uses the same resource bundles standard in the Java platform, including the naming convention, properties file or XML file. Using ResourceBundles, you can pull out messages in your markup using <wicket:message>, or use a ResourceModel with the component to pull out the localized text. Another available option is to directly localize the filename of the markup files, i.e. HomePage_es_MX.html, HomePage.html. Your default locale will be used for HomePage.html, and if you were from Mexico, Wicket would dutifully grab HomePage_es_ MX.html. Wicket’s Label component overrides the getModelObjectAsString of Component to offer you Localaware String’s output to the client, so you don’t have to create your own custom converter. Wicket in Action is an authoritative, comprehensive guide for Java developers building Wicketbased Web applications. This book starts with an introduction to Wicket’s structure and components, and moves quickly into examples of Wicket at work. Written by two of the project’s earliest and most authoritative experts, this book shows you both the “how-to” and the “why” of Wicket. As you move through the book, you’ll learn to use and customize Wicket components, how to interact with other technologies like Spring and Hibernate, and how to build rich, Ajax-driven features into your applications. \nThis tag is used in your template to define the area associatedf with\nthe component. Anything outside of this tag’s hierarchy will be\nignored. It is sometimes useful to wrap each of your templates with\nhtml and body tags like so:\n<html xmlns:wicket=”http://wicket.apache.org”>\n<body>\n<wicket:panel> ... </wicket:panel>\n</body>\n</html>\nIn this example, you can avoid errors showing in your IDE, and it\nwon’t affect the resulting HTML.